Can Crypto-Currency Revolutionize the Music Industry? It was only a matter of time before cryptocurrency  pervaded the music industry. The proliferation and potential applications of blockchain seem to be the perfect fit for the challenges struggling musicians face. While musicians are the creators of their art, it’s the record labels that distribute the music who tend to own the songs. 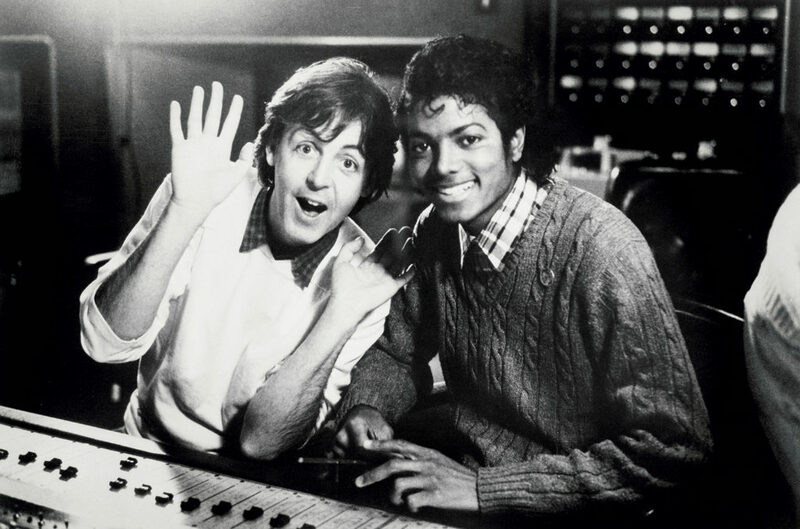 It is for this reason Paul McCartney has now been fighting for 40 years for the rights to The Beatles albums. As technology evolves, some crafty music executives have been devising new ways for musicians to protect and sell their songs. Hakim Draper, cofounder of Boogie Shack Music Group, has been creating a new means for every artist in the music industry to have their very own digital currency. 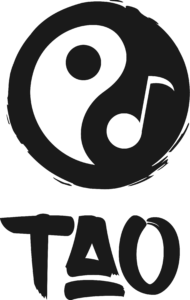 Boogie Shack has teamed up with Tao Network, a blockchain-based content distribution platform for the music industry, and plans to use XTO tokens (XTO = Tao Network’s abbreviation for it’s cryptocurrency) to create a unique currency for music artists. Each artist will be able to sell rights to their songs in exchange for XTO tokens. The potential for musician’s intellectual property (IP) to be converted into monetized data will serve as a direct pipeline between artists and their fans. Artists and fans may very well collaborate on songs, merchandising, and tours, meaning the level of fan involvement will directly correlate to an artist’s success. The more artists rely on other funding sources, the more of their rights they are forced to give away. This has the potential to be a great step forward for artists in the music industry assuming that the fans who support these artists using cryptocurrency will have the artist’s best interests in mind. It should also be noted that cryptocurrencies such as XTO—especially in their early phases with limited funding—are controlled by a very small number of people who could potentially thwart/control the artist. It should also be noted—even despite all the traction it has been gaining—cryptocurrency is not regulated by the SEC, so it is new ground that many are skeptical about. There has been no legal entity or other organizational form that governs and protects the ongoing developments and ensures fair decision-making for cryptocurrencies in the United States. Most issues stem from the complexities around who “owns” a song. Ownership is critical as it secures the right to royalties for any use of the song for the owners fortunate enough to be royalty holders. As we are in the year 2018, it’s not surprising that streaming has emerged as the most important source of incoming royalties representing 62% of royalty revenue in 2017 (worth about $5 billion). Record companies tend to walk away with the lion’s share of revenue, while only the most popular artists and songwriters gain relatively small sums of money relative to the popularity of their output. To put it in perspective, struggling artists have complained that a million listens on a streaming service are worth about $100 to the writer of the song once the music industry has taken its cut. There are a few blockchain-based solutions that exist for paying musicians via crypto-currency. Bitmark—a crypto startup that uses blockchain technology to enable property rights for digital assets—has partnered with Asia’s largest streaming platform KKBOX to create a mechanism for artists to see instant payments when their songs are streamed on the service. Another huge startup crypto contender in the blockchain world goes by the name of Vezt. The Los Angeles-based blockchain startup brought in its funds via initial coin offering (ICO) worth $4.7 million, which it’s planning to use to launch its royalties management platform. The team at Vezt has already landed the rights to some 30 songs from music icons: Dr. Dre, Kanye West, Jay-Z, John Legend, and Drake. 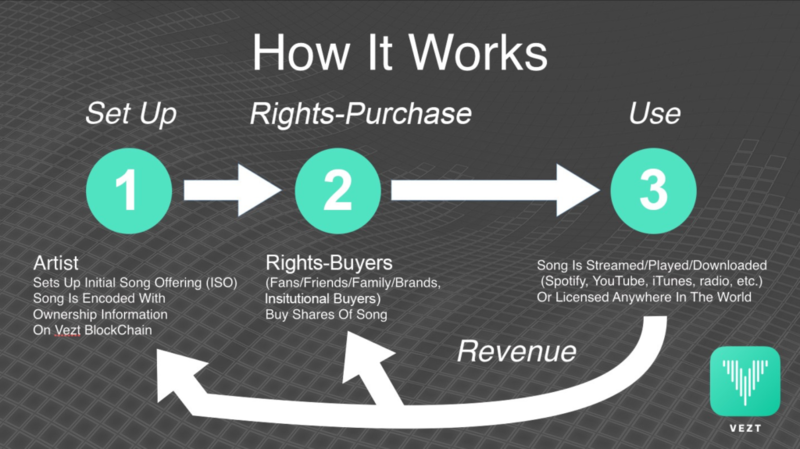 The platform allows the rights holder to a song to sell their portion of the rights through an initial song offering (ISO). Artists and rights holders can then choose how much they would like to raise from a fraction of their song, set the reversion term and set a date for the ISO. Rights are purchased with the tokens issued by Vezt. Musicians are paid with the funds from the crypto offering (after Vezt takes its cut), and the digital rights to the song move to the buyer’s Vezt digital wallet. The song rights information is encoded on Vezt’s blockchain, and the startup will distribute purchaser royalties and allow users to store profits on the platform. It should be noted that changing those profits out of Vezt tokens and into fiat currency, or even another form of digital currency, comes with a fee of at least 5%. Where do Music Cryptos Currently Stand? Vezt still has a long way to go before it makes a name for itself among the ASCAPS and the BMIs. Drake and J. Cole’s, “Jodeci Freestyle” (strong verse from a younger Cole very Born Sinner) became the first song to ever be featured as an ISO as a Beta test for Vezt last November. However, Drake only offered 10% of the publishing of the song, not the actual master, which means artists are still hesitant to go all in on the platform. At this stage it is an interesting idea, but one that is not likely to make a lot of money for either artists or investors in the near future until it gains some serious traction. While the current generation of musicians may not become fully acclimated with crypto currency, it is most certainly likely to only gain in popularity among the younger generations. In other words, as musicians from younger generations become pertinent, IP will be more commonly valued as monetized data. Thus, musicians and the music industry alike are looking forward to seeing how monetizing data will impact (and potentially revolutionize) the Intellectual Property industry as a whole. Jonathan Stempel, Paul McCartney settles with Sony/ATV over Beatles music rights, Reuters Entertainment News (June 30, 2017), https://www.reuters.com/article/us-people-paulmccartney/paul-mccartney-settles-with-sony-atv-over-beatles-music-rights-idUSKBN19L2ET. Stuermer, M., Abu-Tayeh, G. & Myrach, T. Sustain Sci (2017) 12: 247. https://doi.org/10.1007/s11625-016-0412-2. Ian Allison, Bitmark partners with Asia’s biggest streaming service KKBOX for music rights and royalties, International Business Times (January 11, 2018), http://www.ibtimes.co.uk/bitmark-partners-asias-biggest-streaming-service-kkbox-music-rights-royalties-1654831. Max Greenwood, Vezt Wants You to Buy Rights to Drake’s Music with Blockchain, Techvibes (November 15, 2017), https://techvibes.com/2017/11/15/vezt-wants-you-to-buy-rights-to-drakes-music-with-blockchain-technology. Author sewellnylawPosted on February 12, 2018 Categories blogTags Blockchain, Boogie Shack Music Group, Cryptocurrency, Drake, Entertainment Law, intellectual property, IP, IP Transactions, Music Law, Song Rights, Sony/ATV2 Comments on Can Crypto-Currency Revolutionize the Music Industry?